If the rat and the lizard are soaked by rain, the water dries from the lizard's body but it does not dry from the rat's body. Nigerians are very dramatic people and this I have said countless times, all noise and very little in terms and focus and direction, all hot air, plenty smoke but no real fire--or at best sooner or later depending on the divide, the water dries, or the rat continues to suffer the cold long after the rain. I have followed all the noise that has accompanied the BMW bulletproof cars bought by the Nigerian Civil Aviation Authority NCAA for our darling Minister For Aviation, Princess Stella Oduah, and quickly let me add, I have been part of the noise, but really what is the noise about? Much ado about nothing, is it a case of how much do the cars really cost, was the price over-inflated, by how much, was it budgeted for, and less I forget, apart from being bulletproof, are the cars accident-proof, and do the cars fly over traffic, has the purchase improved the lifestyles of villagers from the Minister's clan. I am very aware of a few agencies owing salaries in the aviation ministry, indeed much ado about nothing. Why are we screaming corruption, only weeks ago during the media tea-shop chat my beloved President said in one sweep, our problem is not corruption and has also said he knew those that were corrupt but won't mention their names. On both counts I agree with him. After all the last time I checked, about half a dozen ministers had bulletproof cars, some 30 governors had same, they are all under threats--I don't know ordinary Nigerians can't understand the threats to this leaders. Much ado about nothing--the FCTA is proposing a new city gate for N64bn to tackle the threats--two things, the gate either leads to heaven or will equally be bulletproof. Few kilometers after the current city gate is a primary school without lavatory, classes holding in makeshift rooms. Much ado about nothing, how much noise is being made, afterall Fashola's government purchased three bullet proof cars- Jeeps- with bomb detector apparatus and surveillance cameras. Their brand of the bulletproof cars is identified as Toyota Prado Jeep, Oduah's is BMW--so what? "The cost of each jeep- including handling, registration, insurance and other fees- is two hundred million naira. The three jeeps are valued at six hundred million naira. 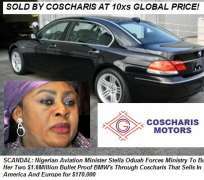 This is double the amount spent by Ms Stella Oduah in the current bullet-proof jeep scandal." "The three automobiles were reportedly bought for Asiwaju Tinubu and Governor Fashola on grounds of 'security'." "My comrade James Ibori bought $250,000 armor-plated Hummer several years ago. When the "Act of God" caught up with him, he was in far-away Dubai. The bullet-proof Hummer was thousands of miles away and useless. Lucky bought, Nyame bought, Bafarawa had, Orji Kalu bought, and the earth has and will not capitulate. We make so much noise, but really we are left drenched like the rat. While the actors dry up and give us the next script. Months back, we screamed blue murder--give her panadol not postinor, even pagans became Islamic scholars, some asked when Mary conceived Jesus and swore to kill Yerima my brother with a sledge hammer forgetting the man is just a political ant--and after a few weeks much ado about nothing. Did you know 19 governors will accompany Jonathan On Pilgrimage To Israel on October 22, 2013, they will also visit Rome and Greece on the prayer spree or spiritual journey, one which its importance cannot be over-emphasized. Just as another 14 governors and countless state functionaries will be coming back from Hajj yet they all need bulletproof cars. Sack her, fire him, and then appoint another to buy his/her own bulletproof Kia or Peugeot. Its a turn by turn affair. We, the people are at the receiving end. We have made more noise in few days about Stella's bulletproof than our 'solution-proof' impasse between FG and ASUU. Do I really care about bulletproof reasons for the misdemeanor of our government officials or their accident prone actions? No! I am only bothered that we are the real culprits, we are the rats wet with hatred, wet with idiosyncrasies of whose religion, ethnic, creed, all is good as long its our brother involved. We are the victims--after we make all the noise, another bulletproof scandal follows. How about the jet-buying men of 'god', how much noise have we made, how about the billions spent eating in the villa, or the N900bn expended on 'acts of god' called constituency projects by the national assembly. A nation with billion naira churches and mosques and yet we need bulletproof riding ministers, same ministers that have done so well, yet they are not scared proof, they forget that courage is only present where there is fear. They buy bulletproofs, they give us Keke-NEPAP without proof, and SURE-proof: are we ready to demand good governance and responsive leadership irrespective of what proof they give for their maladministration--only time will tell. Disclaimer: "The views/contents expressed in this article are the sole responsibility of Prince Charles Dickson and do not necessarily reflect those of The Nigerian Voice. The Nigerian Voice will not be responsible or liable for any inaccurate or incorrect statements contained in this article."